up being an entertaining weekend full of surprises. the best run defence in the nation. 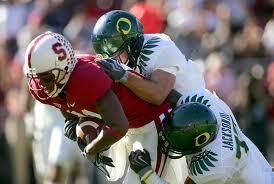 Shayne Skov, that could cause plenty of problems for Oregon’s three-headed backfield. The player who holds the real key to the outcome of this game is Stanford QB Kevin Hogan. signal-caller displayed tremendous poise last week, leading the Cardinal to a victory over Oregon State. No. 1-ranked team in the nation in just his second career start is likely asking just a bit too much. end up finally getting taken down in Madison on Saturday. they should be able to avenge last year’s stunning last-second loss in Columbus. Austin and Stedman Bailey are clicking, the Mountaineers will have a good shot to pull off the upset at home and pick up a much-needed win. while UCLA comes into it looking to make a statement that it’s ready to finally beat its crosstown rival. This game has all the ingredients to become a high-scoring offensive shootout. Oklahoma State and Texas Tech are averaging a combined 82 points per game, and they each have an explosive passing attack. Ultimately, this game could come down to which team has the ball last.